100% inspection and color measurement. 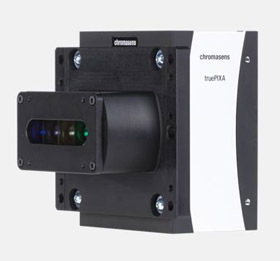 Combining line scan technology with a color measurement system, the Chromasens truePIXA camera delivers extremely accurate measurements of colors along with absolute color coordinates. Spectral selective image sensors acquire a multi-channel image of the object. With up to 12 spectral channels, these images are the basis for calculating spectral values and color coordinates with the innovative Chromantis software developed by Chromasens. The spectral images and color coordinates are made available with the Chromantis-API that can be easily integrated into your software environment. Use the Chromantis GUI for a quick start.